LONG BEACH — Fresh-cooked lobster, live music and a variety of activities for the whole family are scheduled for the largest lobster festival held outside the state of Maine: the Original Lobster Festival at Rainbow Lagoon, Sept. 7-9. 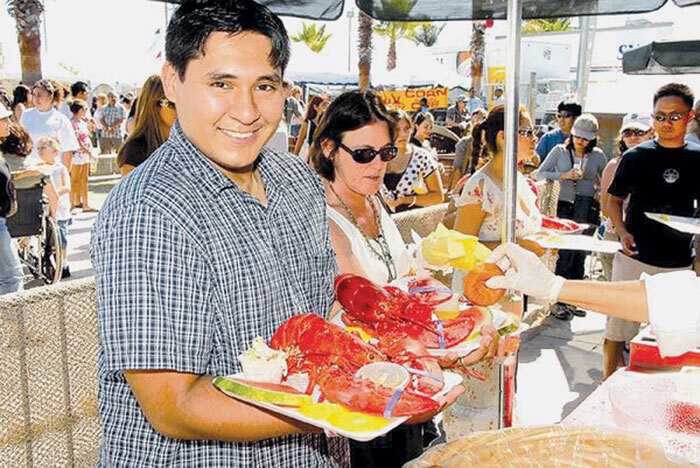 Festival-goers are expected to consume tons of lobsters, steamed on site in what is billed as the world’s largest cooker and prepared by a master chef. Along with the main attraction, festival attendees will find a food court, a children’s area, a dance floor, two stages for live performances and beach bars. Musicians scheduled to entertain this year include the Nathan Owens Motown and Soul Revue, A.J. Gibbs: The Mydeco Dance King, the 1970s-1980s dance band Decades, the Bill Magee Blues Bank, Bonne Musique Zydeco, the 1960s-era sounds of Aquarius, the Southern rock band Rebel Soul and Upstream, performing a blend of reggae, calypso and soca. On the Children’s Stage, performers will include storytellers, magicians and more — including juggling and magic entertainers Terrell and Takako. Ticket prices are $13 for one-day general admission, without food. Regular one-day admission that includes a 1.25-pound lobster feast is $25 in advance, $35 at the gate; admission with a 2.25-pound lobster feast is $50 in advance, $55 at the gate. Optional add-ons for purchasers of a general admission ticket include a lobster roll ticket, priced at an additional $17; and a fried lobster-on-a-stick ticket, also $17 extra. Festival hours are 5-11 p.m. Sept. 7, noon-11 p.m. Sept. 8 and noon-10 p.m. Sept. 9 at Rainbow Lagoon, East Shoreline Drive. Parking is available for $10 at Marina Green, near Long Beach Convention Center, 300 Ocean Blvd. For online tickets and more information, visit originallobsterfestival.com.